“But this won’t happen,” she added cryptically. “Kidnapping is not alien to Alawite families that have long suffered at the hands of the Assads’ shabiha and sidekicks. However, it’s the first time kidnapping takes place over differences of political opinion,” she said. Qardaha is a sleepy mountain town of 20,000 Alawites overlooking the coastal city of Latakia. Its chief claim to fame is that it is the birthplace of the late Hafez al-Assad, president of Syria for nearly 30 years. 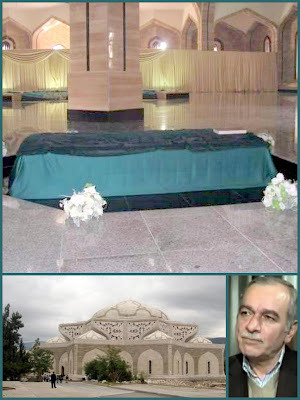 It is also home to the Assad mausoleum, where Hafez, his mother Na’asa and son Basel, who died in a 1994 car crash at the age of 32, are entombed. Tension and unrest have been on the rise in Qardaha since September 28, when local enforcer Mohammad al-Assad, a cousin of Bashar nicknamed Sheikh el-Jabal (or “Lord of the Mountain”), was killed in a shootout with rival Alawite clansmen. According to various press and social media accounts, Mohammad al-Assad was in a town café when he overheard a discussion of the growing number of body bags and death notices in Qardaha, the escalating level of violence in the country and the risk this represents to the Alawite community. Mohammad al-Assad took offense when a member of the Khayyer clan said Bashar should step down, having mishandled the uprising. He pulled out his firearm and started shooting, triggering a prolonged gunfight between his Assad and allied Shaleesh cohorts and members of the rival Khayyer, Abboud and Othman clans, all of them Alawite families. Novelist and Alawite activist Samar Yazbek, a kinswoman of the Othmans, said last Monday five of her relatives had been killed. The Khayyer, Abboud and Othman families are well respected within the Alawite community. They have produced many lawyers, engineers and doctors. Hostility between the Khayyers, three of whose girls have now been taken hostage, and the Assads dates back a long way – to the execution of the poet Hassan al-Khayyer in 1979, according to France’s authoritative Le Monde. The hostility was inflamed last month by the arrest of Dr. Abdelaziz al-Khayyer on his return from an official visit to Beijing with a delegation of the National Coordination Committee for the Forces of Democratic Change, an opposition group tolerated by the regime. He has not been heard of since. Bashar’s father Hafez had jailed Dr. al-Khayyer, a physician, for 13 years. “If it’s a scene reminiscent of the film ‘The Godfather,’ that’s because this is indeed a town run by a ruthless mafia-style family,” said Syria expert Fabrice Balanche, who is head of the Mediterranean and Orient Research Group at Lyon University. Balanche was not surprised that rival clans had started to turn against the Assads, who have maintained a stranglehold over the town since before they changed their family name from al-Wahesh in the 1920s [Wahesh is Arabic for “Monster” while Assad means “Lion”]. “They were originally a minor Alawite family that over time imposed itself on the region by brute force,” Balanche said. “Many previously powerful clans have been marginalized, and we’ve been hearing for months that Alawite families are fed up of seeing their sons die and are worried for the future. The story of the gunfight at Qardaha has also been told by former French diplomat Ignace Leverrier on his Un Oeil sur la Syrie (An Eye on Syria) blog. Leverrier paints Mohammed al-Assad as a government-sanctioned Mafia lord, making huge profits from business across Syria and of using the Mukhabarat secret intelligence service as a weapon to terrorize the local population. He even made money, according to Leverrier, by taking payments from families with relatives in prison in exchange for information on their health and whereabouts, continuing to give positive reports for cash when some of these prisoners had been long dead.